When Lake Poopó, Bolivia’s second-largest lake, dried up last December, an entire community lost their way of life and the scientific community cast their eyes to the map asking, where next? They didn’t have to look far. According to a report prepared by the World Lake Vision Committee, a collaboration between the International Lake Committee Foundation, the Shiga Prefectural Government of Japan, and the United Nations Environment Program, there are very few major lake systems that are not experiencing decreasing water quality, volume, biodiversity, or some combination of the three. The world’s lakes are in peril, and along with them, the livelihoods and security of the people who depend on them. Alongside degradation due to human activities, climate change is a contributing factor. Recent studies report that lakes are warming even more rapidly than the world’s oceans or atmosphere due to climate change. As a result, ecosystems are experiencing a double squeeze. The diminishing quantity and quality of freshwater is more than an ecological nightmare, it is a pending social disaster. For generations, entire societies have relied on the resources provided by major lake systems. What happens when these resources are gone? Upstream from what was once Lake Poopó sits Lake Titicaca. Straddling the border between Peru and Bolivia, Lake Titicaca is the world’s highest altitude navigable lake. But in recent years, Lake Titicaca has been rapidly losing volume. At the same time, pollution from surrounding agricultural activities and cities, invasive species, and overfishing are further taxing the ecosystem. The combination of human impacts and climate change could result in the loss of one of the most critical water resources for Bolivia and Peru. Over time, drought and diversions for agricultural and municipal use have drastically reduced the size of Lake Titicaca. According to Circle of Blue, from 2003 to 2010 almost 500 square miles of the lake’s surface were lost, nearly 15 percent of the total. Pollution flows into the lake from the Peruvian city of Puno and the Bolivian cities of La Paz and El Alto, untreated and unmonitored. Estimates indicate that as much as 80 percent of El Alto’s untreated raw sewage and waste eventually trickles into Lake Titicaca. Inflow from glacial sources is sharply declining as well. Even if the post-Paris climate goal of limiting warming to 2 degrees Celsius is met, Lake Titicaca will likely lose 85 percent of its current volume due to climate change, according to some estimates. Climatic factors combined with human impacts are stretching the limits of the lake’s ability to provide for the 2.6 million people who depend upon it. Similarly, in West Africa, Lake Chad is an essential resource for an estimated 30 million people, 80 percent of whom are rural inhabitants directly dependent on the lake for their livelihoods. As the lake shrinks, so too do opportunities for economic advancement. Between 1963 and 2001, Lake Chad dwindled to 95 percent of its original size. The decline has been attributed to climate change and large withdrawals for agriculture. In a region with over 70 different ethnic groups spread across four countries, high rates of poverty, and a turbulent history, it is unsurprising that experts, including the Intergovernmental Panel on Climate Change (IPCC), are concerned about a spike in conflict. The instability of Nigeria, Chad, and Niger pose a risk to the security of the greater region, as well as complicating the development and implementation of transboundary management plans. However, because nearly 50 percent of the drying trend can be attributed to climate change, multinational bodies such as the Lake Chad Basin Commission will have a difficult time achieving sustainable water management. In Central Asia, the larger and shallower eastern lobe of the Aral Sea went completely dry for the first time in more than 600 years in the fall of 2014. A body of water roughly the size of Ireland went from a productive ecosystem to nothing in 50 years, causing a fishing industry that employed over 60,000 people to vanish and leaving 3 million people in what could only be called a disaster zone. Vessels that once pulled in enough fish to not only sustain the local population but feed a healthy export business now provide shade for cattle. In addition to food insecurity driven by the absent fishing industry, the cultivation of food and cash crops has suffered across a wider area as the majority of agriculture in the region depended on diversions from the Aral Sea for irrigation. The demise of the Aral Sea, and the insecurity of the millions of people who relied upon it, is a disaster that could have been prevented. During the 1950s and ‘60s Soviet central planners designed and built the Karakum Canal, the world’s largest supply canal, diverting nearly all of the lake’s natural replenishment. Water that once flowed into the Aral Sea from the Amudarya, Murghab, and Tedzhen Rivers now ends up spread over crops in the desert. The consequences of increased warming are severe. If trends continue as they are expected to, algae blooms could increase by 20 percent, 5 percent of these being toxic blooms, O’Reilly’s study warns. While algae are naturally occurring organisms, high concentrations can devastate aquatic ecosystems and threaten human health. Algae blooms occur when algae grow out of control, typically as a result of abnormally warm and nutrient-rich water. They result in decreased levels of dissolved oxygen in aquatic ecosystems, which threatens the health and populations of other aquatic species such as fish and invertebrates. Changing ice cover in temperature regions is affecting ecosystems as well. Higher temperatures are causing a decline in ice cover around the world. The IPCC reports that over the past 30 years, lakes in the northern hemisphere are freezing more than 4.5 days later each fall, and in the spring, ice is breaking up six days sooner than in 1975. Ecologically, this means lakes are warmer for longer, disrupting breeding cycles and causing heat stress in fish. Increased warming also means increased evaporation. This not only threatens water security for people, but the overall viability of ecosystems. In extreme cases, like what has already been seen with Lake Poopó, the Aral Sea, and Lake Chad, the result could be the total loss of a lake system, leaving nothing behind but a dry, contaminated expanse of nothing. Because of the lagged effect of climate change, many of the climate impacts on lake systems are unavoidable in the near term. However, there are options for communities to protect their aquatic resources and improve resilience. An essential step is to reduce agricultural pollution entering the watershed, particularly fertilizers. Changes in light availability and temperature naturally increase algae production; however, by limiting pollution, communities can drastically reduce the severity of algae blooms. The damming and diversion of source waters, as well as the toll of overall consumption, must be evaluated quickly with priority given to increasing the amount of freshwater flowing into lake systems. While often overlooked, lakes play critical social, economic, and cultural roles in the lives of hundreds of millions worldwide. However, if current trends persist, many of the world’s large lake systems could dry out completely. Correction, February 9, 2017: An earlier version of the text referred to Lake Titicaca losing 15 percent of its volume due to climate change; the source estimates it could lose 85 percent. Sources: American Geophysical Union, Circle of Blue, The Handbook on Environmental Chemistry, Intergovernmental Panel on Climate Change, Lake Chad Basin Commission, National Air and Space Administration, National Geographic, National Oceanic and Atmospheric Administration, Nature, NBC News, The New York Times, Science, Scientific American, TeleSUR, Think Progress, United Nations University, World Bank, World Lake Vision Committee. 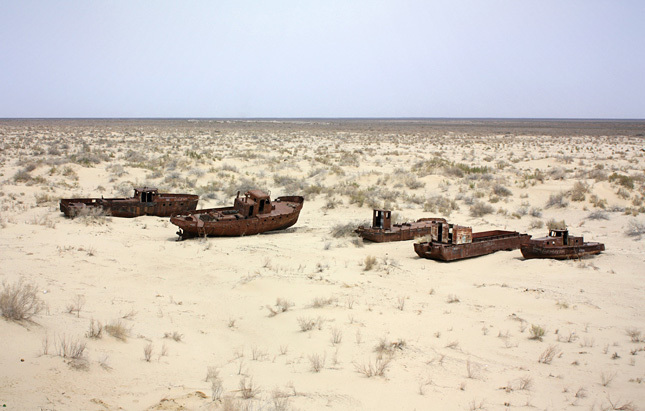 Photo Credit:Stranded boats in Moynaq, Aral Sea, courtesy of flickr user Arian Zwegers.